Not only is New Zealand the shaky isles, but in some parts, has an aroma all of its own. This also includes mud baths (mud volcanos), sulphur valleys, geysers, and thermal spas. 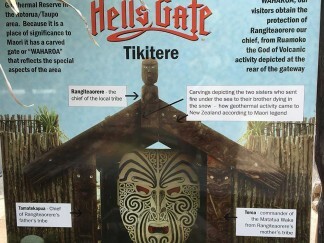 Let’s not forget some wonderful names that come with the terrain, such as Hell’s Gate, Devil’s Bath, Sulphur Bath, and you get an idea of what place on Earth we visited – ROTORUA. The smell lingers in your memory for ever to be honest, but still an amazing place. The spas have areas of different temperatures to suit, ranging from 35c to 42c. Wonderful for a dentists back, neck, hand in fact all over! The minerals are also very therapeutic. You just lie there like a lobster, and get cooked! The Maori god of earthquakes, volcanoes and seasons is Rūaumoko. He is the youngest son of Ranginui (the Sky father) and Papatūānuku (the Earth mother) – commonly called Rangi and Papa. This god is the cheekiest and most unstable of all their gods. That explains everything! 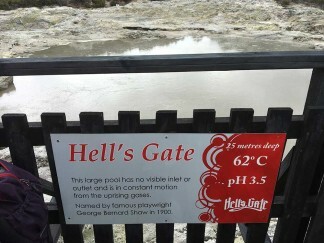 Anyway there is a geothermal park called Hell’s Gate. This was named by George Bernard Shaw when he visited New Zealand. 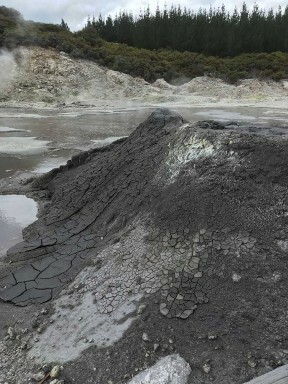 He did not believe in God then, but after a visit to Rotorua, he believed in Hell. We enjoyed having a mud bath but as the mud does block up the pores of your skin you are only allowed 20min in it otherwise you will over heat, like the park around you! It seems the whole of New Zealand is connected. The crust of the earth is very thin here, and the molten magma is only 2.5km deep. There is a very hardy tree a called the Manuka tree, that can grow on the mineral rich soil in the geothermal park. The famous honey is derived from this tree. Two weeks before the first Christchurch earthquake, many of these trees died. 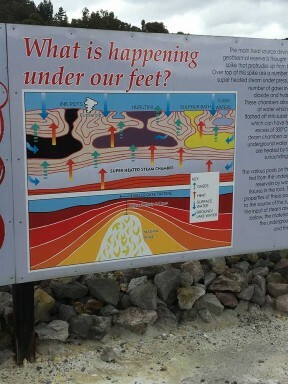 The thermal activity rose as the below ground temperature increased. Then the day before the quake, all the bird life started to fly away, till just before the quake it became deadly quiet. When the quake hit Christchurch in the South Island, the Hell’s Gate Geothermal suffered extensive damage to its pathways; and even Wellington’s port was damaged, preventing certain ships from docking. The country roads throughout the island are constantly being repaired. I really started to hate the road works 30km signs in my travels! Here is the dental twist. We passed a dental practice in town, with their motto, “Enjoy tomorrow’s dentistry today”, which I might add “as there may be no tomorrow!” (Just kidding! Sort of).